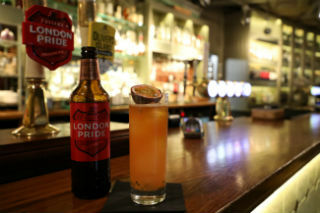 Due to the growing consumption of cocktails, paired with customers looking for more premium experiences, Fuller’s, London’s oldest family brewer, have decided to add something unique to their latest Summer cocktail… London Pride! Working with our cocktail champion, Tom Martin, the General Manager of the Sutton Arms, Fuller’s created the “Pride & Passion” – a gin based cocktail which uses passion fruit liqueur and fresh passion fruit to deliver a refreshing drink perfect for any summer occasion. Pride & Passion was launched at the annual Fuller’s Inns Conference, where all the managers had a chance to try the cocktail, learn how to make it and provide any feedback. Give it a try for some summery, fresh, sour, citrus, light, and sweet flavours. Fuller’s, London’s oldest family brewer, have decided to add something unique to their latest Summer cocktail… London Pride!